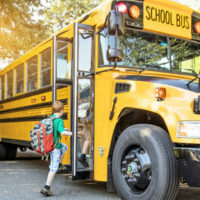 With the latest bus accident and subsequent injuries that garnered headlines in South Tampa earlier this month, it is crucial to revisit what leads to bus accidents and how to better prevent these accidents from occurring. In particular, it is critical that all motorists realize just how important it is to understand and obey school bus laws. According to one State Board of Education, each year, 33 school-age children die in school-bus accidents.Most of those who are killed are between the ages of four and eight, and are on their way to board the bus, or have just exited the bus. The biggest risks for those who ride the school bus face are potentially getting hit by their own bus or by a passing vehicle that is violating the bus warning systems. Others—including the driver or passenger of the vehicle other than the school bus—also sometimes die in these accidents. In terms of understanding signals that school buses use, it is important to note that flashing amber (yellow) lights serve as a warning that the bus is preparing to stop to load or unload children, while flashing red lights with an extended stop arm means that the bus will be loading and/or unloading children (i.e. traffic must stop). They do not always stay where the bus drivers can see them. In addition, unfortunately, issues involving alcohol, speed, and traffic offenses are sometimes contributing factors that can lead to students and others getting injured or killed on buses. In some instances, these accidents can involve car drivers who failed to regard stop signs and hit buses with students inside the bus, as well as passengers in their car. Drivers who operate vehicles negligently can, under some circumstances, be charged with causing death or injury while operating a vehicle (in addition to facing civil litigation to provide compensation to the victim and their family). (Drivers) in school zones should constantly be on the lookout for children walking in the streets. A recent study just revealed that Florida is home to the worst drivers. This makes it even more crucial that, as drivers, we look out for children who ride school buses, and as parents, we instruct our children to be as cautious as possible while near the school bus. Under the law, buses owe a higher legal duty of care to passengers and to the general public. While bus accidents do not occur often, when they do, the results can be devastating. They can result in catastrophic injuries; and sometimes even death; sometimes for the most vulnerable members of our society. If you or a loved one has been injured or killed in a bus accident, contact our experienced Fort Lauderdale bus accident attorneys at Friedland & Associates today. We serve clients and families throughout Florida.